If I may be so bold as to try to lure your attention away from Trump and Mueller for a moment, consider Jamie Dimon's lament, delivered a few days before Mueller delivered his report. Dimon is the chief executive of JP Morgan Chase, and wrongdoing by him and the CEOs of other big corporations is more responsible for Trump's election than anything Russia dreamed of, as I'll explain. "A big chunk of [Americans] have been left behind," Dimon said, unveiling a new $350m program to train workers for the jobs of the future. "Forty percent of Americans make less than $15 an hour, 40% ... can't afford a $400 bill, whether it's medical or fixing their car; 15% of Americans make minimum wages, 70,000 die from opioids." All true, but $350m over five years isn't even a drop in the ocean of Americans who have been left behind. Nor is it a large sum for JP Morgan, America's biggest bank, whose profits last year alone amounted to $35bn. The annual budget of the US Department of Education is $70bn. Dimon's own compensation package was $31m last year, and his reported net worth is $1.3bn. 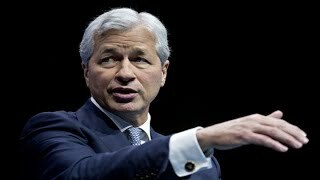 Besides running JP Morgan, Dimon also chairs the Business Round-table, composed of the CEOs of America's largest corporations, whose 2018 profits broke all records. The Business Round-table's motto "More than Leaders. Leadership" suggests some higher purpose than making the rich richer, but CEOs like Dimon say their hands are tied. Their responsibility is to their shareholders. But why, exactly? If Dimon and the others were serious about helping most American workers whose real wages have been going nowhere for decades and job security is dwindling, they could use their outsized political influence to push for laws requiring CEOs to consider all their stakeholders, not just shareholders. Rather than reflexively seek tax cuts, they could push to raise taxes on corporations and wealthy Americans like themselves, so there'd be more school funding to prepare American kids for the jobs of the future. If this sounds far-fetched, that's only because we've come such a long way from the era of the 1950s to the 1970s when the heads of big American businesses viewed themselves as "corporate statesmen" and lobbied for measures to improve the well-being of all Americans. Those CEOs supported civil rights, argued that unions "serve the common good," urged stronger environmental protections, and even backed campaign finance reform. But then came the 1980s corporate raiders, Wall Street "greed is good" manipulators, Ronald Reagan's market fundamentalism, union-busting, and a gusher of corporate money into politics. Since then, most Americans have come to believe the system is rigged in favor of big corporations and the Street, and they're right. But nothing is stopping Dimon and other major CEOs from putting an end to the rigging. They could reduce the need for candidates to raise funds from corporate Pacs and the wealthy by supporting the House Democrats' first bill, HR1, providing public financing for campaigns backed by small donors. They could push for stricter limits on the "revolving door" between industry and government, and laws requiring full disclosure of the sources of all campaign funding. Why shouldn't Dimon and other CEOs be in the vanguard seeking a constitutional amendment to limit lobbying and campaign spending? The answer is: nothing is stopping them except their own parched, self-serving notion of leadership as maximizing profits and shareholder value. For 40 years, CEOs of America's largest corporations and Wall Street banks have abdicated this responsibility. We are now living with the consequences. Jamie Dimon and the Business Round-table can see those consequences as well as anyone. Rather than announce token jobs programs, they'd be better served seeking to increase the economic and political power of left-behind Americans, many of whom will otherwise continue to vote for demagogues who only make them feel powerful. With Washington completely ignoring this issue in favour of one sector of the American economy, income inequality is most likely going to continue to grow over the coming decades.